Congrats to UK blogging librarian Phil Bradley, who is celebrating 10 years of blogging! For me, Phil Bradley is the original "Librarian 2.0". He writes on search engines, web usability, and librarianship; all important topics for me. In fact, I've probably read far more of those 10 years worth of posts than I care to admit. So, "cheers" to you, Phil! Your writing and rants traveled some 7500 kilometers over here to the west coast of Canada. I hope your online voice will carry forward for a long time. The map shows 232 routes currently in operation, with 12 more planned in the coming year. As ExtremeTech points out, submarine data routes like these have been around for some time. 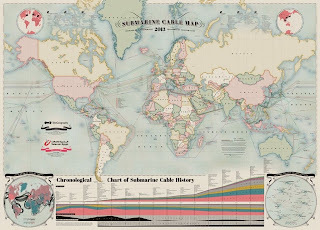 The first ones dating back to the 1860s for transatlantic cable runs. If there's a common theme here, it might be that no technology is immune to the physical realities of mother nature. Regardless of whether you're tugging lines across the ocean for early telegraphs in the 1800's, or prepping for terabytes of data in the 21st century. Steve Matthews is the founder of Stem Legal, a company that helps law firms build online profile and increase web-driven business. He is the former Knowledge Services Director at a Canadian law firm, with 12 years in-house experience guiding web marketing, KM and Library initiatives. He is a Past President (07/08) of VALL, and a member of CALL. Steve regularly publishes his thoughts on legal technology & research here on the VLLB and on Slaw.ca. Further commentary on legal web marketing & SEO can be found over at Stem. This work is licensed under a Creative Commons Canada Licence. Postings on the Vancouver Law Librarian Blog are provided "as is" with no warranties, and confer no rights. Opinions expressed are the personal opinions of Steve Matthews, and do not necessarily reflect the views of my company.